I'm very proud of my braid today. Today felt very much like a Monday. I'm running on very little sleep right now due to a very ill behaved kitty who got into a lot of trouble last night. Zephyr seems to go through these bouts of restlessness that can only be cured by snooping in my closet and literally climbing the walls. Ugh. Due to my sleepless night, I really wanted something comfy to wear today and this borrowed oxford shirt from Chris is just the thing. The shirt's pretty beat and actually stained up quite a bit, but it's been washed a million times and has that super softness that's the best. It makes the perfect impromptu wrap shirt. So, how was your weekend? ...Unbelievably wet and rainy! On Friday I travelled to the Cape to visit family and celebrate my cousin's induction into Mass Maritime Academy as a Cadet. 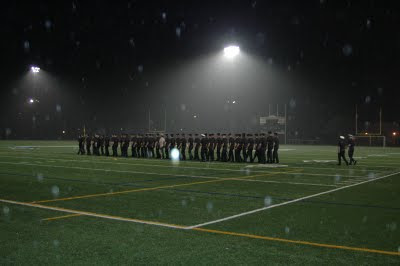 Friday night we drove to the school to watch the marching competitions- can you see the intense rain?- where each company competed against each other. The next day we all got up early and went back to MMA to watch their graduation from Orientation. It's pretty amazing- and also a little eerie- to watch 350 people march in unison. 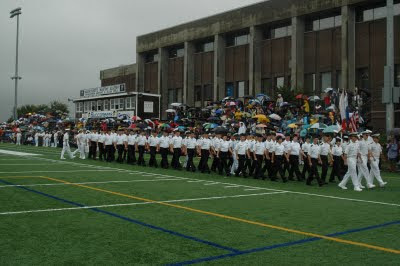 MMA's Orientation is much different than your typical college's orientation, it's run more similarly to a boot camp, so it's pretty exciting to be inducted as a cadet and officially be part of the school. After the ceremony we all travelled back to my grandparents house to dry off and eat tons of food. I wish the weather had been nicer but it was still really nice to spend time with family! Now I'm off to watch some Season 2 Gossip Girl (!!!) and clean my dirty messy house! Love the wrap shirt idea & the hair is fab ! 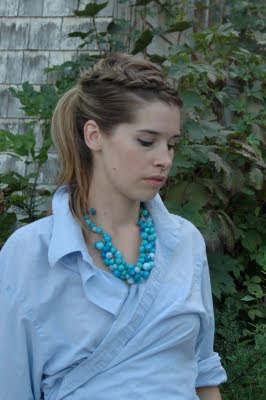 I love the different shades of blue in this outfit and am sooo jealous of your braid. I love the wrap. Can you show more detail pictures or explain how you did it? @KansasCouture: thanks, the braid took a lot of mastering! @MjToell: the wrap shirt is very very easy, I think it works best with a super big shirt (chris is a size XL) just put the shirt on and wrap both sides very close to your body, secure the outside flap with a couple of safety pins (big ones look best) until you obtain the desired snugness. roll the sleeves up to desired length. Oooh, I love the idea of the wrap shirt!!! I'm SO going to try it with one of Joe's shirts!! 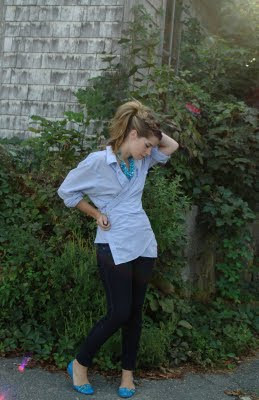 Ah wow I love the way you wore your shirt, it's such a simple idea but it looks very polished. And your hair is lovely. You should be proud of your braid! Looks beautiful! By the way where do you live in MA? I live in Brookline, just fifteen minutes outside of Boston! Love those flats--I have the same ones in black and white, but like a chump I paid full price. Good find! I'm applying to Academy of Art University in San Fran. I've never lived in a big city, so if I go, it should be really interesting! Your hair looks so darling like that! I envy your long hair! The growing out process is so darn miserable! I LOVE your hair!! I'm gonna have to try and copy that :). @Clare and Carrie: glad I could inspire! thanks! @UnBelOiseau: I live on the North Shore in Beverly! @Jenna&Maura: thanks, I love the buckles on them- I've never worn such bright shoes though! @Divinity Avenue: That sounds great! I'm looking for the big city/ bug school experience as well. @LeProust: yeah, the growout process is intense! I've been growing mine out for five years- basically since I cut it into a really bad Chelsea in college- but don't worry, it'll happen! @ Elaine: thank you! it takes some practice- basically the braid is an inverted french braid- I can't wait to see it on you! Love that necklace! and also jealous of your braid! I just wanted to let you know how great I think your blog is! I am also from the Boston area (I live in the city at the moment); it is just to find other people from Massachusetts. Your outfit is super cute!! I love that necklace too! I cant believe you got it at Forever 21 (and I cant believe I didnt see it there myself) for $12. Very nice!! @amy: thank you, I really appreciate the feedback! I always love to hear from local bloggers as well and am going to check out your site right after I'm done typing! Oh that wrap shirt looks amazing on you! You have such great style, chickadee! That's cool that you got to see your cuz get inducted, he must have felt special having you go out there for it. Bummer about the rain though! You should be proud! That is one fabulous braid + this is one fabulous blog. I'm just loving it.